At Aspen Stone and Landscapes we specialise in all aspects of stone construction. Our highly driven and experienced team of stonemasons have worked on commercial, residential and civil projects throughout South East Queensland. We endeavour to use as much old world stone masonry techniques to give all of our projects a customised finish, and we only use the highest quality materials. 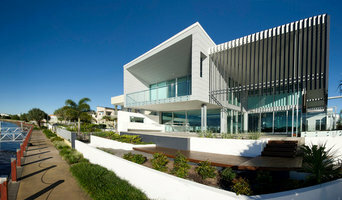 Contact us for details on our highly acclaimed projects throughout South East Queensland. Austral Masonry is one of Australia's largest suppliers of quality masonry products. Austral Masonry’s range of coloured, standard and premium masonry have set a new standard in quality and style for the versatile concrete block. By adding oxides and coloured sands to our mix of raw materials, we produce blocks with contemporary colours, textures and appeal. Ideal for a range of projects from a modern beach residence to impressive commercial projects Austral Masonry has an array of products to suit your style. Austral Masonry blends fine sand, cement, aggregate and quality colouring agents to produce unique coloured blocks. Having long been the workhorse of the construction industry, our products are frequently specified in cutting-edge residential and commercial designs due to their strength and versatility. Part of the Brickworks Building Products Group, one of Australia’s largest and most innovative building product manufacturers, Austral Masonry is part of a group of manufacturers which includes other industry leading brands such as Austral Bricks®, Bristile Roofing®, Austral Precast® and Auswest Timbers®. 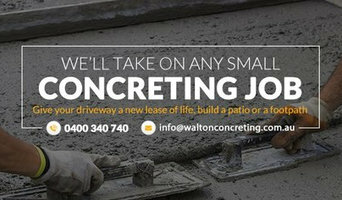 Walton Concreting are specialists in small concreting jobs on the Gold Coast. Along with small concreting jobs we also do stump grinding, rubbish removal, driveway pressure cleaning and driveway re-sealing. We have all the equipment and experience to complete your small concreting job in a cost effective and professional manner. 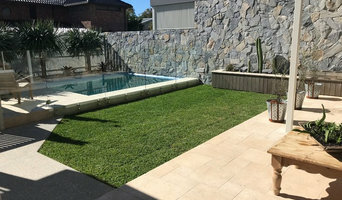 We do concreting for: • Footpath • Pool surrounds • Driveway • Patio • Shed slabs Our concrete services: • Stamped concrete • Plain concrete • Concrete sealing • Exposed aggregate • Coloured concrete • Concrete slabs. Call 0400 340 740 Monday to Friday between 7:00am and 5:00pm or use our online contact form for a free quote. A.J.E. Masonry Expert stonemasons in residential and commercial projects, constructing stonework for retaining walls, pillars, water features, fireplaces and more. Read More AJE Masonry specializes in all aspects of quality stonework. We have worked on projects from Melbourne to the Sunshine Coast but now work predominantly in Brisbane, Gold Coast, Northern Rivers and the adjacent hinterlands. With more than 20 years in the industry, we offer you the services of reliable and talented stonemasons who are experienced in everything from the order and delivery of stone through to the finished project. AJE Masonry has been involved in Multi Award Winning Projects with renowned builder MCD Construction. At Granite Marble Stone Australia we take pride in ourselves on using the finest Natural Granite or Marble from the best known Stone Quarry's around the world, We specialize in colours such as "Black Galaxy'', "Black Forest Gold'', "Bianco Carrara'' or "Calacutta''. Fire Places, Stairs and Bench Tops with Cabinets Packages play a major part in our business. In the last 10 years, Engineered stone made an appearance and has become quite fashionable to most customers, We supply engineered stone from; Smart Stone, Quantum Quarts, Essa, or Caesar Stone. We also supply Natural Granite, Most customers assume Natural Granite is more expensive than engineered stone. This however is not the case if you want something that will last. We all know that granite is a natural product, with many varieties of colours, quality and prices. Cheap granite can also look stunning. The trick is with design.. You should try to accommodate to all the surrounding things in your project for example: The size, The colour of the floor, the walls, the cabinets, the lighting and the space that you have to work in. We employ the most experienced people in the Stone Industry, to ensure that the quality of our job is at the highest standard. Here are a few tips on how to organize your project and any avoid problems: · -Check to make sure the company you choose has a valid BSA Licence · -Ensure when you're asking questions, the supplier knows what they're talking about. · -If you would like more background knowledge, ask about where the Granite is from, as Granite is minded from specific areas around the globe. · -Always have a final quote and plan for your project. · -Try to visit you stone masons factory, It helps if the factory is somewhat clean and tidy, but do keep in mind it is a factory. ·- -Ask what the negative and positive points are about the particular stone you are choosing -Ask if the supplier if they "seal" the stone, As not all stone has to be sealed. -Ask if the supplier cuts on site, If they do, there are only a few hole that should be cut onsite; A drop in sink & Power points. Really anything else should be done in a factory with accurate machinery. Supply and install stone benchtops for kitchen and bathroom vanity. Scheduled delivery is guaranteed. At Creative Concrete Coatings, we’ll help you bring to life any concrete surface with 100’s of different design combinations. Add value to your home or business by bringing new life to old concrete areas. The designs we can do are only limited to your imagination. • Concrete Stencilling • Epoxy Flooring • Decorative Concreting • Concrete Grinding • Concrete Sealing • Covercrete Call us on 0481287365 to find out how we can tailor an epoxy flooring or concrete resurfacing solution to suit your budget. We are based in Brisbane and we’re open Monday to Friday 7:00am to 5:00pm and Saturday 7:00am to 1:00pm. Willycrete Concreting Specializing In All Your Concreting Needs.We are Fully Licensed,Insured and Professional and a Member of Master Builders Queensland. Concreters Goldcoast do all types of concrete around the goldcoast region. From small driveways, to large scale government work. No job is too big or small for us! 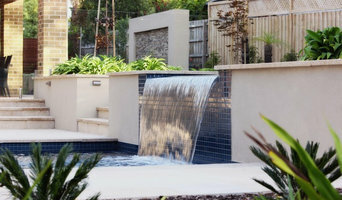 A Gold Coast, Queensland stonemason can add kerb appeal to your home and is usually hired for home projects such as driveways, pathways, pool coping and home facades, but can also build retaining walls and fit stone cladding. In some instances, their work can extend to features inside the home, from fireplace surrounds and mantels to staircases. 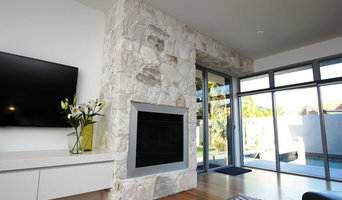 Find a Gold Coast, Queensland stone, paver and concrete professional on Houzz. Scroll through this page to find a stonemason, paver or concreter in your area. Just enter your suburb in the top field to narrow your search. You can browse their latest projects, read reviews and see how other homeowners rate their work, and message them directly.